If you find that you can’t keep a plant because you don’t have a green thumb, try this forest-style planter for your home. It’s a foolproof, long-lasting alternative to traditional houseplants. And decorating your home is even easier when you forage in your garden for rocks, branches, and driftwood to bring this beautiful miniature forest to life. The key is to use a planter without drainage holes. Because the water does not drain, the planter holds in the moisture; watering time is less frequent, thus making it easy to maintain. A selection of woodland-inspired plants with varied textures and sizes, such as ferns, ivy and broadleaf plants with interesting patterns or colors. (My favorite ferns are the Button and Maidenhair shown in the photo.) You will need enough plants to fill the planter — the forest should look lush, not sparse. Put about an inch of charcoal in the base of your planter and layer another 5 inches of potting soil on top. Plant your selected vegetation into the soil. Add details to your forest by covering the soil with decorative moss and rocks. Add that organic touch by placing small branches or driftwood amidst the plants. Watering tip: Add enough water so that the soil around each plant is moist but not soggy. For reference, the planter shown is 20 inches across and takes the equivalent of 1 coffee pot full of water at a time. Do not be discouraged if you’ve neglected plants in the past. If one of the individual plants does fail, you can simply replace it without re-doing the whole bowl. 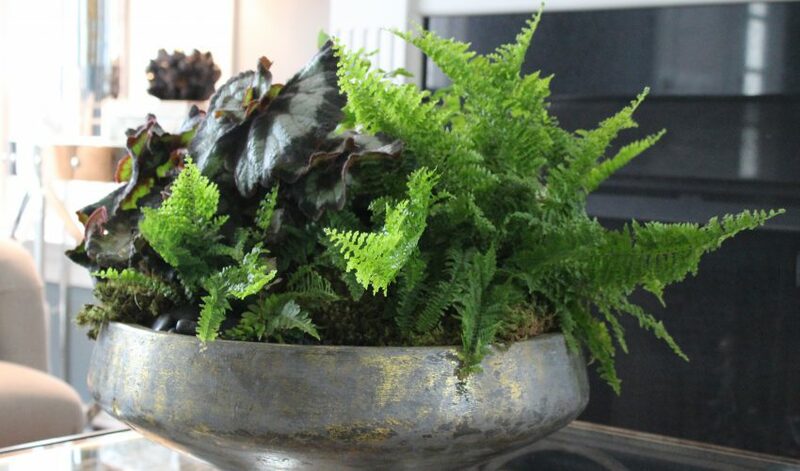 Your Forest Bowl will require little attention while bringing long-lasting life into your home! So get “÷bowl’-ing today.